* The following is an excerpt from the first pages of chapter fifteen. Christians are people of hope. We long for the day when the kingdom of God will be fully revealed, when Jesus will return in glory, and when death itself will be conquered. This is our hope, the hope of Christians past and present. – Stewart E. Kelly. Yes, if Christianity is true, it is clearly not a theory. It is a love affair with life and its author. It is reality. – Mary Poplin. Forecasting the future is risky business. We experience the now, can peer into the past, but the future remains murky. We see through a glass dimly. The practical means of considering tomorrow, then, is to decipher historical patterns and trends. Objects in the mirror are closer than they appear, precisely because the past frames our present. This also means our future pulls from the back-story. Game of Gods has labored with this in mind. Patterns exist. Foundations have been laid and pieces are being assembled. What, then, does the future entail as we erect this Temple of Man? Might oneness be institutionalized into a world union? Could we see a substantially reformed United Nations, or maybe a new body, to supersede the aging assembly? Will this represent a practical synthesis of East and West, of mysticism and management? The view of the world as seen from space is ‘a beautiful blue planet,’ not a patchwork of pink, yellow and purple blotches separated by dotted lines. A wholistic, one-world view is emerging from space travel and other miracles of modern technology and from communication. A new consciousness is also emerging from a growing awareness in the West of the wisdom of the Eastern world-view. Buddhism, Hinduism, Taoism and Shinto, while they differ in many respects, portray the world as a multi-dimensional, organically interrelated eco-system of which man is one of many inter-dependent parts. Perhaps we can learn through them to see the world whole, as it really is, and together – West and East – begin to build the foundations of a new world order. The most urgent item on the planetary agenda is to set the limits of freedom and order in supra-national, global affairs. A constitution for the world is needed which combines the achievements of both hemispheres: that is, constitutional limitations and a bill of rights from the West and a spacious world-view from the East. The allure of world government still tugs humanity. It is unlikely, however, that a future planetary system will be a secular construct – it will reflect the occulture of its age, and build upon the myth of Re-enchantment presented at the time. Religious leaders, too – explored in chapter 12 – have a history of interfacing with global political visionaries, and the interfaith community is a voice for progressive internationalism. The two movements already walk hand-in-hand, acting as joint fulcrums for change. Could there be an authoritative merger, a synthesis of pragmatic politics and established religions? This would require a dominating, global impetus: A crisis of magnitude. The notion may seem fanciful in times of relative peace, but this can change in the flash of atoms splitting over a city. How will transhumanism be embodied? What are we willing to trade for the fruit of technological assimilation and its promise of near-immortality? Are we drinking an elixir to a better life, or ripping the lid from Pandora’s box? Might our digital tools, wrapping the world in an ever-tightening web, become the definitive vehicle for coexistence and interconnection? Will we give up autonomy for hive-mind convenience; that Marxist dream of perfect productivity as the means to equality? This portends a revolutionary period. In that case, will our digital tools be used as silicon bludgeons to beat into submission those who question the prevailing ideology? What will techno-oneness look like? I am reminded of a workshop attended while I was at Burning Man, 2018. The subject was artificial intelligence, crypto-currencies and psychedelic spirituality. The discussion was led by a major personality in the field of smart contracts, and digital governance was on the table. Implied was a new civilization built on four interlocking blocks: 1) a new spirituality inspired by shamanic techniques, 2) the new ethos being constructed, in real-time, at Burning Man, 3) a digital means of exchange, tied into and validating the new social contract, and 4) artificial intelligence as the management system. Being described was a scalable, techno-pagan, social-spiritual synthesis. How will our new myths unravel? As we embrace the gospel of global citizenship with its stipulation of planetary loyalty, what will we sacrifice in service to Gaia? Pagan practices of old conjure gruesome images. Will we find ourselves looking down from the blood soaked platform of a Mayan temple, or see children sacrificed in the fire-red arms of Molech? Might we legitimize such morbid rites of fertility and seasonal cycles? No. We are too sophisticated for such primitivism; just ask any one of the 50 million human babies aborted every year. Are there comparative differences between the two? Of course: this is not argued. Abortion, nevertheless, is absolutely recognized as a means to maintain Earth’s sustainability. In fact, during the Global Citizenship 2000 Youth Congress, Robert Muller boasted how policies he helped to develop had prevented the births of 2.2 billion children – for the sake of Mother Earth. Maybe the two, Molech and the modern world, are not so far removed after all. A more supernatural angle must also be considered. Are we approaching a future in which the Pagan deities of ancient times become more to us than just symbols of nature and enlightenment? The Bible, a book revealing the supernatural world, outlines the fact that unholy entities exist. Christians accept the supernatural reality of God, and we acknowledge that satanic hosts are active – that Satan was the accuser before Job in the Old Testament, and that the Devil is like a lion searching for prey – but as products of modern thinking, we tend to downplay the serious nature of Pagan spirituality as found in Scripture. If the Pagan past is being conjured to project our future, then we face a troubling thought: that the spiritual personalities who enchanted the minds of men then may have a role in re-enchanting us now. More questions arise. How might the Islamic monism of Will – submission, not choice – intersect with visions of Oneness? Islam has a definite structure that frames Muslim identity, informing political, economic and social life; it is more than just a faith. The influx of Islam has added new stresses to Western civilization, already internally cracking as the Christian ethos is undermined. How this unfolds in the face of other emerging changes remains a question of significance. How has Oneness manifested in your home, workplace, and church? Where and how has this overarching paradigm intersected with your life? How might the realization that God is other, and that we are designed as His image bearers, change your perspective – your life? Stewart E. Kelly, Truth Considered & Applied: Examining Postmodernism, History, and Christian Faith (B&H Publishing, 2011), p.325. Mary Poplin, Is Reality Secular? Testing the Assumptions of Four Global Worldviews (IVP Books, 2014), p.265. Lucile W. Green, Journey to a Governed World: Thru 50 Years in the Peace Movement (The Uniquest Foundation, 1991), pp.34-35. A 2018 survey of ten nations concluded that, “Seven adults in ten (69%) think that a new supranational organization needs to be created to respond to global risks.” Attitudes to Global Risk and Governance Survey, 2018 (Global Challenges Foundation, 2018), p.6. Fact Sheet: Induced Abortion Worldwide (Guttmacher Institute, March 2018), p.1. Safe abortions – couched as reproductive rights – are linked to sustainable population control. See World Survey on the Role of Women in Development, 2014: Gender Equality and Sustainable Development (United Nations, 2014), chapter 5: “Ground sustainable population policies in sexual and reproductive health and rights, including the provision of universally accessible quality sexual and reproductive health services, information and education across the life cycle, including safe and effective methods of modern contraception, maternal health care, comprehensive sexuality education and safe abortion” (p.114). In 2009, the case was made for an abortion action-plan specific to developing nations in terms of the “twin challenges of rapid population growth and environmental degradation.” See J.J. Speidel et al., “Population Polices, Programmes and the Environment,” Philosophical Transcriptions of The Royal Society, Biological Sciences (The Royal Society, 2009), p.3060. For an older but critical review of population policies, including abortion, see Julian L. Simon, Population Matters: People, Resources, Environment, and Immigration (Transaction Publishers, 1990). David Berlinski, The Devil’s Delusion: Atheism and Its Scientific Pretentions (Basic Books, 2009), p.xv. Michael S. Heiser, The Unseen Realm: Recovering the Supernatural Worldview of the Bible (Lexham Press, 2015), pp.42-43. From politics to transhumanism to the interfaith movement, Western culture is quickly turning away from a biblical worldview and embracing a false gospel of Oneness. 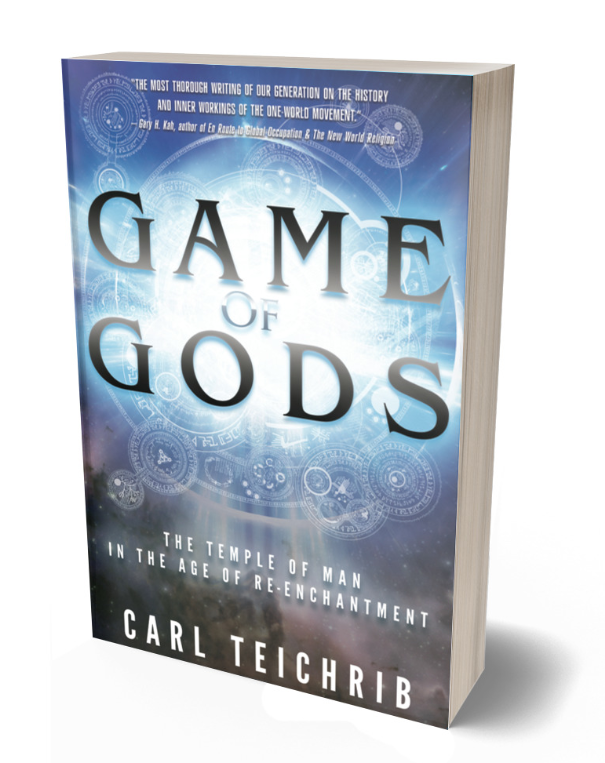 Teichrib skillfully explains the roots of this shift and how the transforming gospel of Jesus Christ is still the only hope for a world enraptured with paganism. Game of Gods is exactly the resource the church needs for such a time as this. Read it!